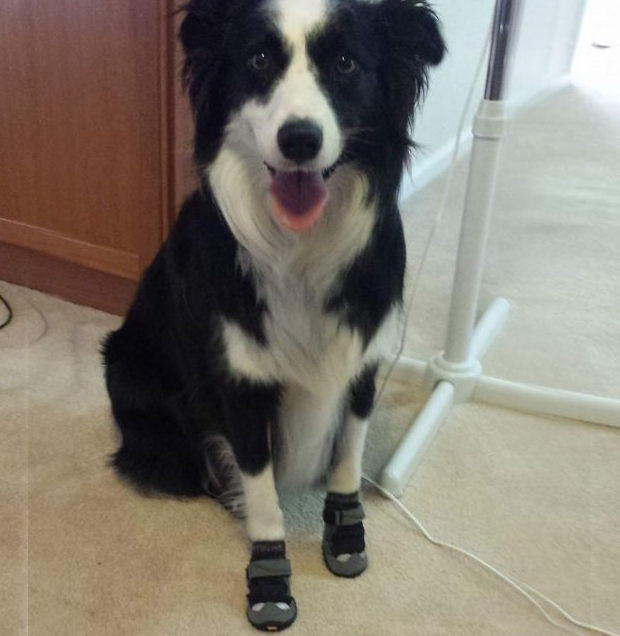 All condition, all-terrain, all-season paw wear. Pair of 2 Boots. 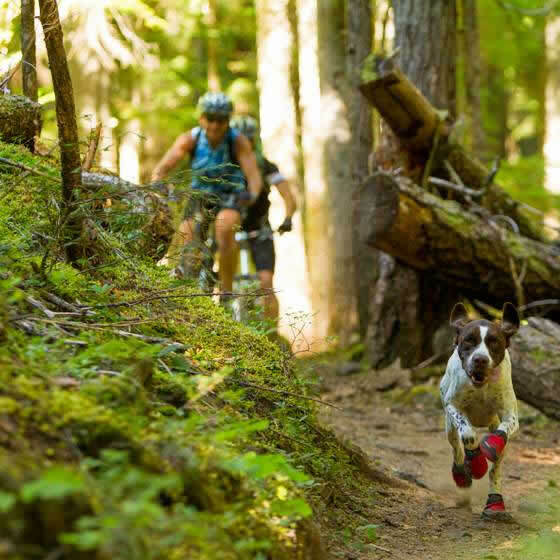 Ruffwear has revolutionized canine paw wear. Ruffwear's Grip Trex Dog Boots feature two major advancements in dog boots: an upper inspired by human shoes and a high performance Vibram sole. 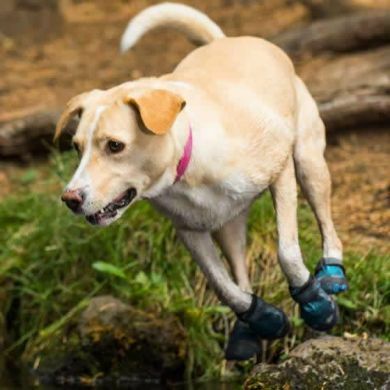 At Waggle we've been carrying Ruff Wear Grip Trex Dog Boots for 10 years now and they have been one of our most popular products due to their innovative design and durability. 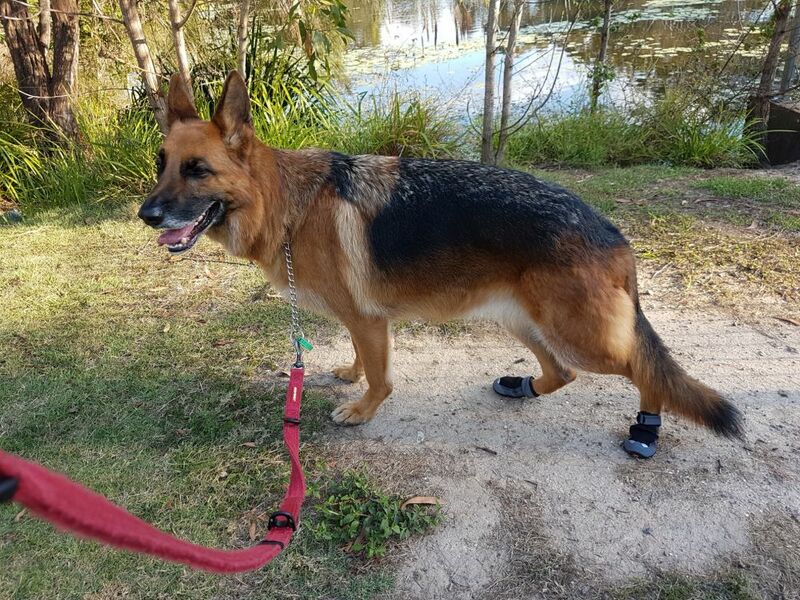 Worn by Australian Police Dogs, Australian Military Canine Units, all the Guide Dogs in NSW and WA, and working dogs across Australia and the rest of the world, these dog boots are practical no nonsense footwear for active dogs and working dogs alike. They protect the dog's paw pads from broken glass, hot bitumen and concrete footpaths as well as thorns and bindi eyes. They are also very effective in protecting against contact allergies to grass etc..
For all service dogs that are taken into shopping centres and department stores these shoes provide reliable grip on the smooth tiled floors and protect their wearers toes when alighting on to or off escalators and so are a great idea for dogs living on tiles and floor boards whose paws are inclined to slip causing discomfort and possibly injury to tendons in knees and elbows. Built on an anatomical mold, just like human shoes, the boot's upper maintains a consistent size, shape, and fit. 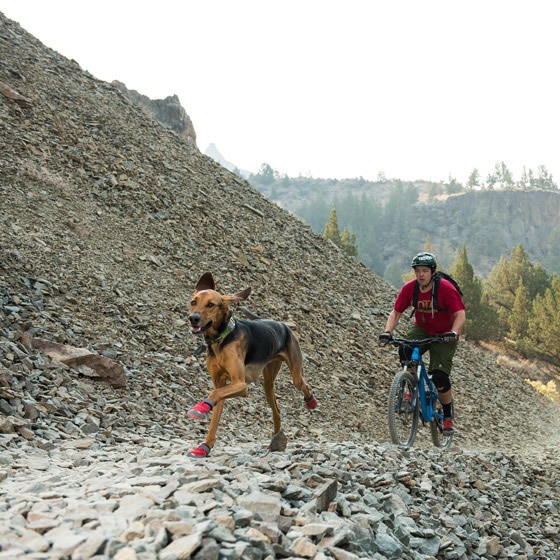 The revolutionary upper design and construction ensures the boots are easy to put on, easy to secure, provide continued comfort, and most importantly, the boots stay on paws-from the first mile to the last. 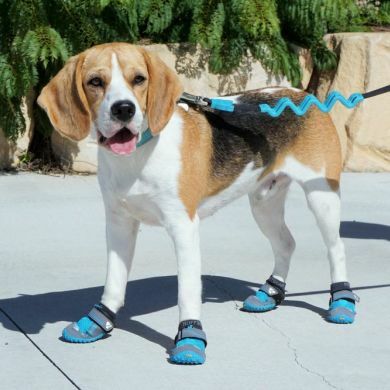 Closure system combines hook-and-loop with hardware, cinching around the narrowest part of the dog’s leg to provide a secure fit. For the revolutionary sole, Ruffwear partnered with Vibram the world's leading developer of soles for active pursuits. The partnership produced the unique Grip Trex design with omnidirectional treads and traction zones customized to the demanding needs of active dogs. The sole generates unequaled grip, traction, durability, and performance. 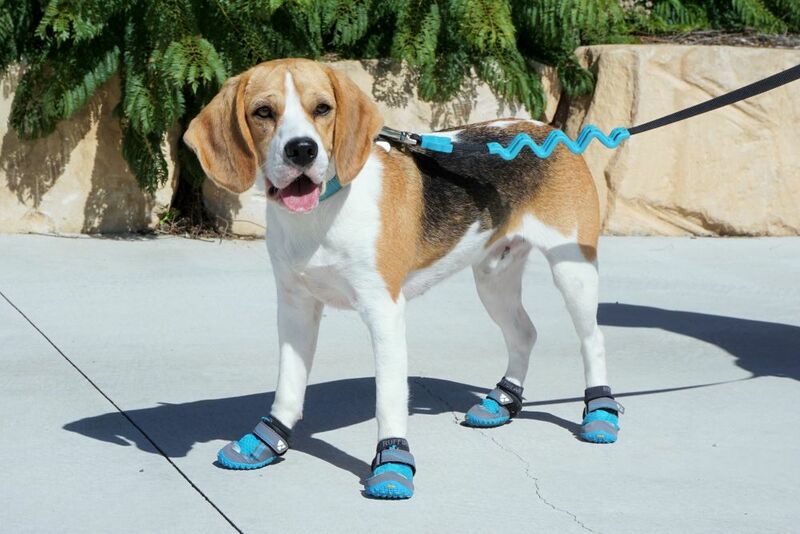 Together, these two advancements produce a completely revolutionary dog boot from top to bottom. 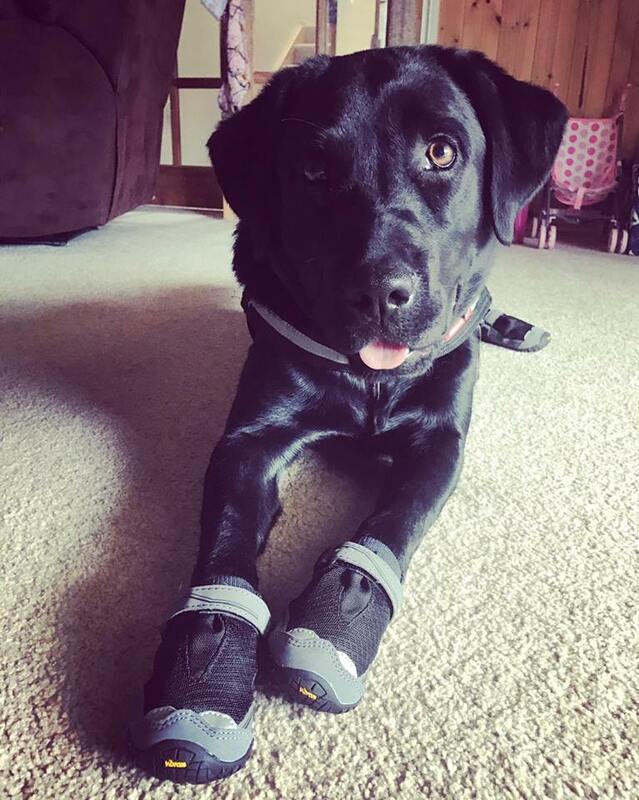 Put Ruff Wear's Bark'n Boots Grip Trex on your dog and unleash the canine athlete inside, then do your best to keep up with your four-legged friend and enjoy the fun. 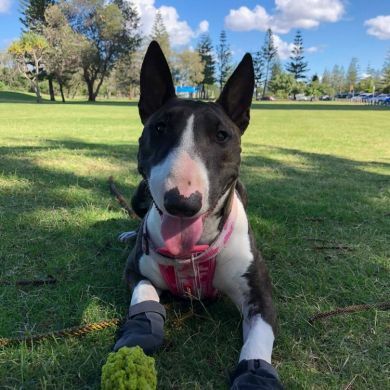 Keep in mind that if the boots are worn for long stretches of time it is a good idea to take the boots off and let your dog's paws have a little breather when possible - especially in summer. Getting the right fit is really essential. For best results when trying out new boots pop the boots onto your dog and launch right into an activity your dog loves. It's a good idea to involve toys or treats. Reward your dog for good work done and do not be surprised to see your dog walking as if he or she is on the moon. 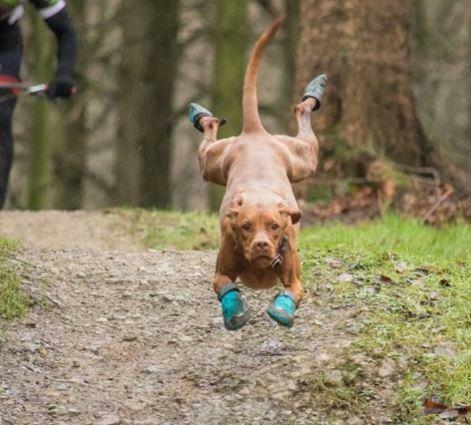 Most dogs adjust to boots in no time. You might want to have your video camera out for the initial trials as it can be quite entertaining to watch. Will The Boots Fall Off? If you get the right measurements your new boots should stay without any issues. The boots are most likely to fall off when your dog is first wearing them as they tend to walk a bit wildly. For this reason and for sizing purposes it's important to give them a go inside the house first. Whe you do try them out outside the first couple of times you might want to keep an eye on your canine adventurer. As your dog adjusts to the boots they are much less likely to pop off. This is a question I am asked often. My view is that the Ruffwear Boot Liners add a lot of value at little expense. Putting the liners on your dog is a snap. And once you have the liners on slipping the paws into the boots is much easier. All the digits of the paw are confined nicely and it's smooth sailing. 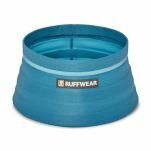 They also provide comfort for your dog by wicking away moisture from the paw. Your dog sweats from the paw. It's one of the only places a dog perspires. 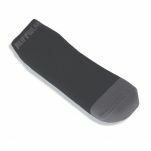 Also the liners will reduce friction on the paws. You know the feeling when your sockless foot rubs on the inside of a shoe. Best to avoid I reckon. Both the liners & boots can be thrown into the washing machine and will dry pretty quickly so you should be fine with one set of each. These shoes are firstly, adorable but secondly really easy to put on! 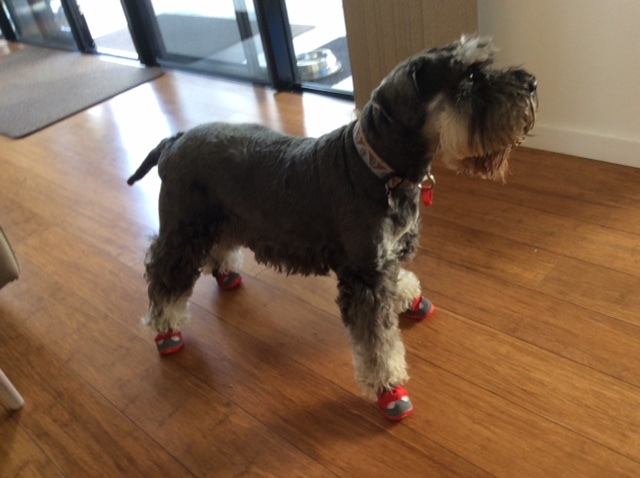 I prefer to walk Bindi during the day so these have been amazing in summer - completely protecting her feet from the burning floor. She took a little time to get used to them but be patient, because she did get used to them! 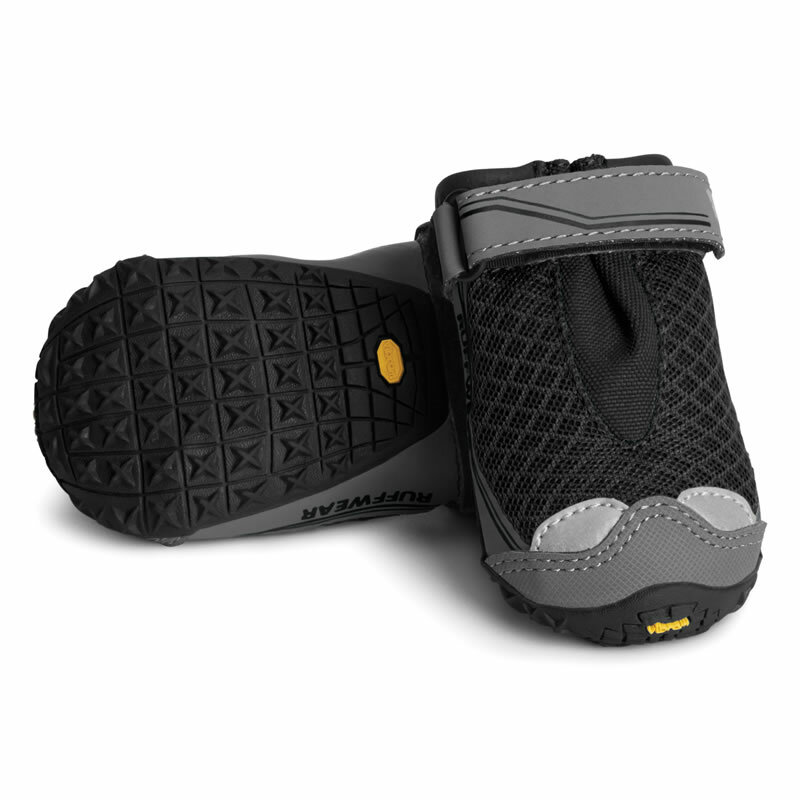 Read 185 customer reviews of Ruffwear Dog Boots Grip Trex (2 Boots). The average customer rating is 4.8. These have been working well with my German Shepherd, who drags one back paw, and has had a bleeding nail. 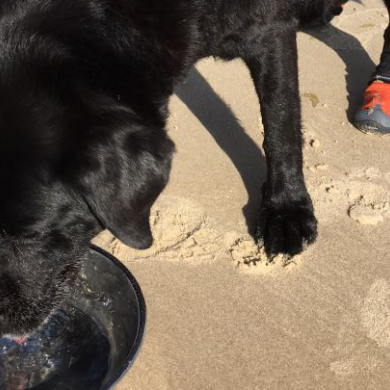 Teamed with the sock boot liners, he happily plays in the sand and sea. Very satisfied. 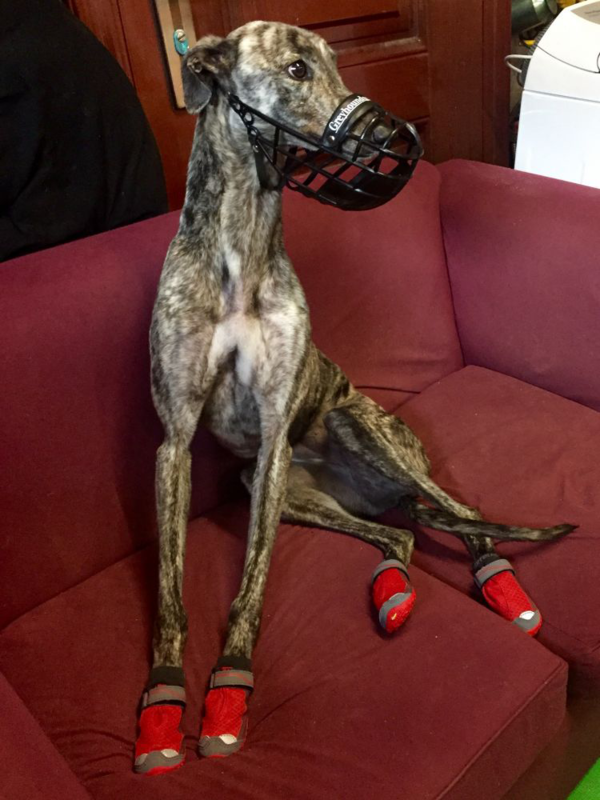 Excellent for our greyhound who has a soft foot pad and when we walk on unmade roads it bleeds. His boot protect the foot and is comfortable for him. The first pair lasted 18 months used two times a day. 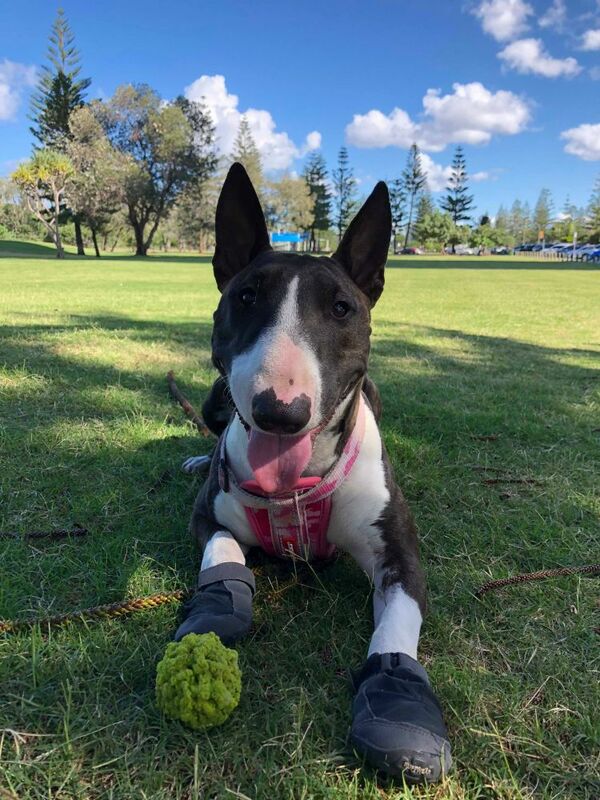 I purchased Ruffwear boots for Lara, who has taken 3 bedridden months to learn to walk again after spinal and nerve surgery. She first had to learn to stop 'knuckling', and we have foam mats and carpets covering all our tiles, floorboards, and outdoor decking area in the home. I ordered the boots once she was able to walk correctly again. The boots arrived within a day, and are of excellent quality - they are also lightweight and look fantastic. They fit easily onto Lara's hind feet, and she is happy to wear them. They have made a world of difference to Lara's confidence in navigating not just around the home, but also in actually picking her feet up properly to walk. She is also much more sturdy on her feet now. She is on a long recovery journey, but what a great purchase to help her along! Note : don't assume you doggo has the same size shoe for all four 4 paws - I needed to order half a size smaller for her back legs. Our Male 9 Year Old German Shepherd Dog has been diagnosed with Degenerative Myelopathy a few months ago. Unfortunately, the disease is making him deteriorate very quickly. During the day he will rarely move, unless it is to go to the bathroom, eat or drink water. I am trying to take him for a 30 - 45 min walk on a daily basis. However, due to his condition, his middle two nails on his back paws are almost non-existent as he drags them continuously. In the last month we also noticed he was cutting open the tops of his paws as the dragging was becoming much more intense and he was falling over a lot due to instability on surfaces etc. 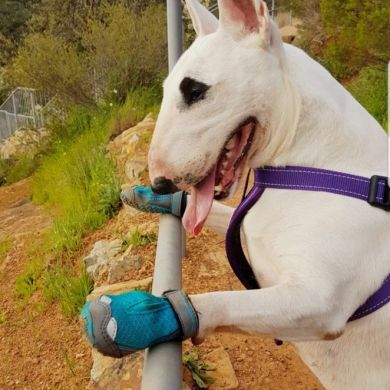 I recently purchased your Ruffwear Summit Trex Dog Boots (PAIR OF TWO) in order to help assist with the back paw bleeding and wearing down of the knuckles. 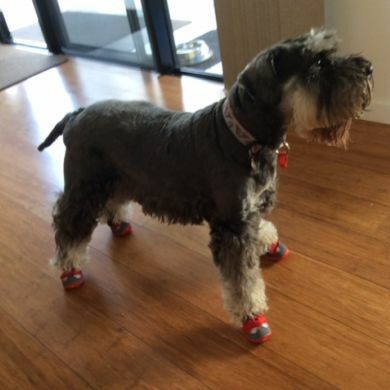 I only put them on him when we are getting ready to go for a 30 min walk each night - but I have certainly noticed they assist tremendously with his stability. 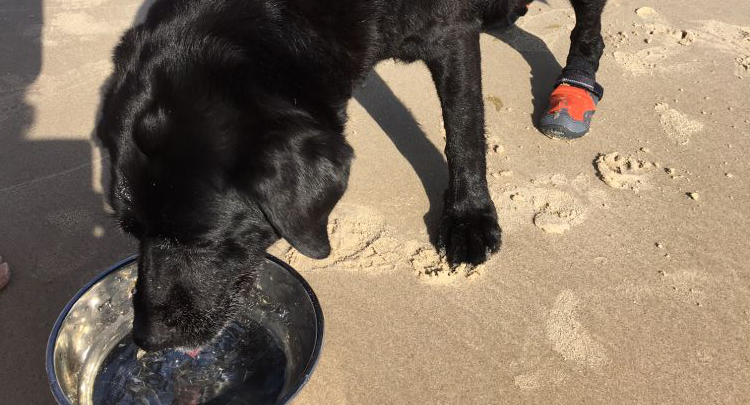 It is still obvious that he struggles to be in control of his back legs, but he is not falling over nearly as much - and there is no scabs or short nails anymore. Our dog is evidently more confident when walking, and is now never in pain no matter the terrain we walk him on. Great little boots! 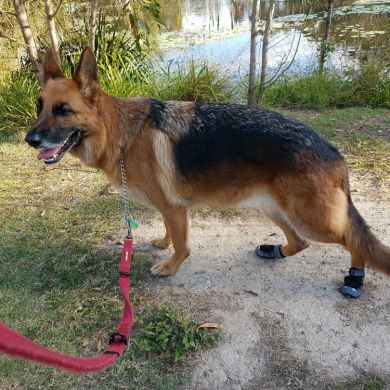 Our 10 year old dog has a degenerative myelopathy and is scuffing his rear feet which is wearing out his toenails, so the boots protect his feet walking to the park on hard surfaces. 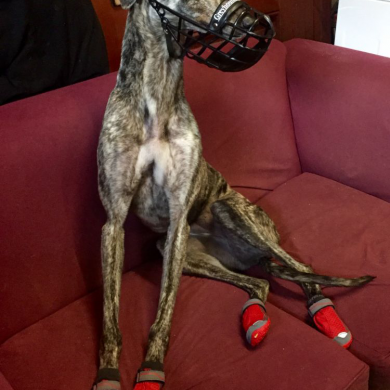 Once there we take them off so he can happily run on the lush grass. They go back on to walk home again. 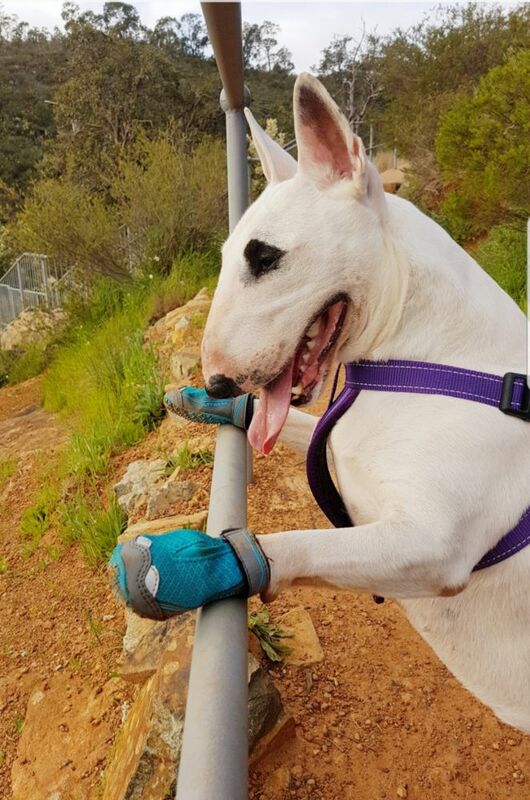 He never objects to having them put on and he can continue to enjoy the outdoors. 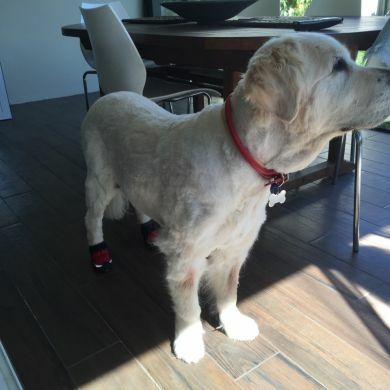 So disappointed that these great little boots were unsuitable for my lovely 13 year old retriever. His back legs are too week to lift his feet and so the boots drag his legs backwards and he can't manage to right them. We use the boots on very hot days to protect the feet and paws. 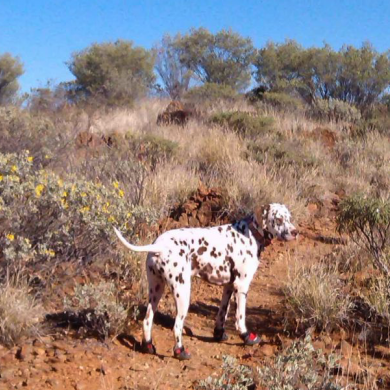 They are also very good in protecting the dogs paws from sharp vegetation and rocks whilst bushwalking. 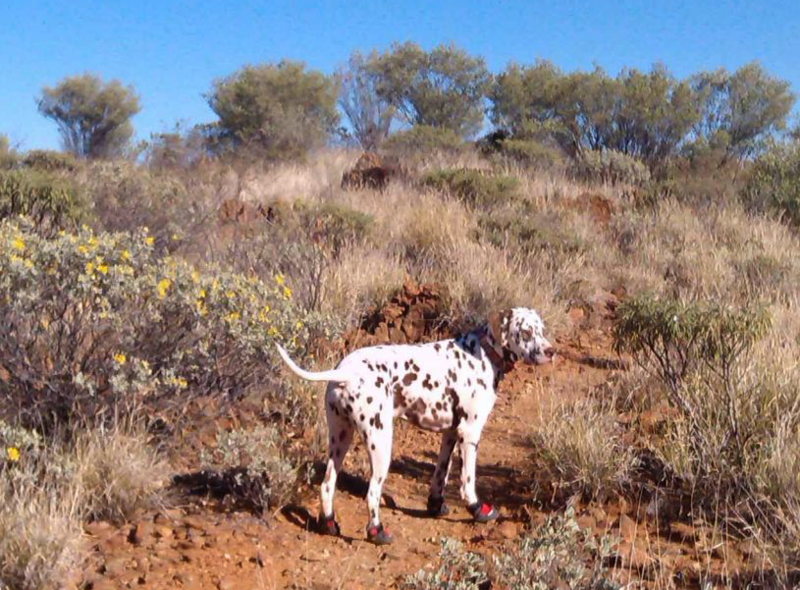 The boots seem to be solid but we found they are very short for our German Pointer. Our dog accepted them but soon we find him leaking one of his foot. The strap fits very low and as a result the dog had blisters on the side of his uncle. We did the measurement as indicated by the video but we noticed the boots strap was sitting in the area where the dog bends his foot, hence possible creating friction. Perhaps two centimetres taller would help? We might purchase a bigger size to see if the problem persist. Our German Shepherd Jess has always worn down her back claws when she walks due to her gait, (cow hocked). This has always been managed by training her to walk on grass rather than paths, and going to grassy dog parks where she runs beautifully and doesn’t drag her back paws. Recently she has been lame on one back leg which has meant increased paw dragging, and the claws wore down further. 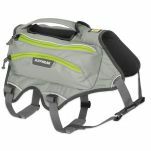 I found Ruffwear Dog Boots on Waggle and bought a pair. Jess immediately seemed more interested in her walk, she’s never tried to shake them off, and stands patiently to have them put on. They are very well made. I just wish we’d bought a pair earlier. My tips – make sure they are securely fastened. 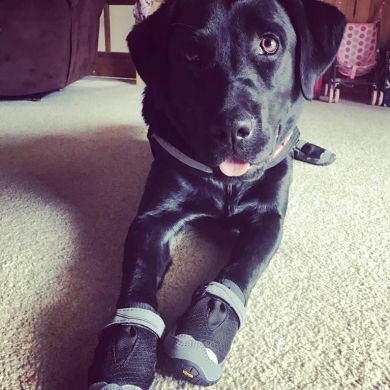 (I sometimes have to readjust them a little after she has done a few steps), check for hot spots in case they rub (I found a little hot spot on one toe), if they get wet, stuff with strips of newspaper as you would with your own runners.